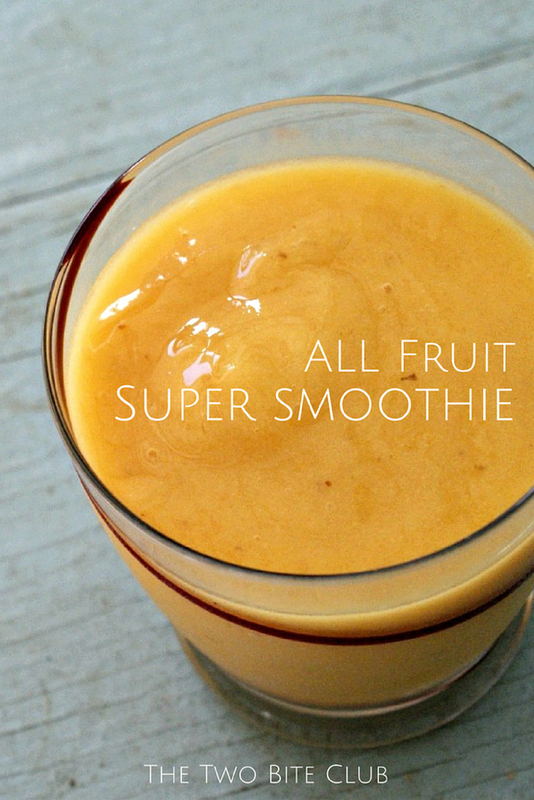 This All Fruit Super Smoothie is made by blending together just four fresh and sweet fruits: banana, mango, papaya and pear...that's it! I've been buying a ton of fresh fruits lately and the kids have been loving it. My 5-year old daughter would eat fruit all day long. The little guy, my almost 2-year old, has been exploring the world of eating fruits whole. Up until a little bit ago, I had cut all of his food up into little pieces. Now that he does really well feeding himself, we've moved onto whole bananas. whole, pears, whole apples. He hates when I cut them up now! I came up with this smoothie a few days ago when I saw a pear in the fridge that my son had taken two bites out of and then decided he didn't want. The kids were ready for a snack, but no one wanted the already-gnawed-on pear. Can't blame 'em. Then it hit me....smoothie! The kids will always take a smoothie. I also had a bunch of papaya that my Mom had given me that needed to be used like yesterday. Then I remembered the mango I had tucked away in one of the drawers. I knew the frozen bananas we had in the freezer would be the perfect thing to tie them all together. A few zips in the blender and we were good to go! So yummy! Why is this smoothie super, you might ask? Tons of vitamins, minerals, antioxidants, fiber, the list goes on and on...just look at the gorgeous colors of the fruit! So much goodness going on! Put all of the ingredients into your blender and blend until smooth. Add additional splashes of cold water until you reach your desired consistency. The frozen bananas made out smoothies the perfect "frozen" texture. If you want your smoothie a little more icy, blend in a handful of ice cubes.